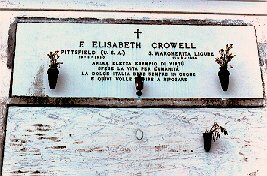 This is the gravesite of F. Elisabeth Crowell in Italy. Frances Elisabeth Crowell, born in Pittsfield MA in 1875, had a notable, but largely unknown, career in nursing. An 1895 graduate of the St Joseph's (Chicago) Hospital Training School for Nurses, by 1896 she was part owner and superintendent of the Pensacola (FL) Infirmary. The Infirmary was renamed St. Anthony's Hospital in 1900, and under her direction, opened a training school for nurses. She left Pensacola and her impressive accomplishments in 1905 and in New York completed social work education at the New York School of Philanthropy. From 1906 until 1917 she was a special investigator for the Association of Neighborhood Workers, publishing a significant study of midwives. She also worked on surveys in Pittsburgh and Chicago. Additionally she served as the Executive Secretary of the Association of Tuberculosis Clinic (NY) from 1910-1917. In 1917 Miss Crowell began her work with the Rockefeller's Commission for the Prevention of Tuberculosis, working in Europe. Later as a field staff member of the Rockefeller foundation she was responsible for nursing education programs in Europe and was hailed by the American Journal of Nursing in 1931 as "one of the most influential person in European nursing today" (Specialists, 1931). She retired to a villa in Italy in 1941 where she served an advisor on refugees for the American Red Cross. She died in 1950 and is buried in Santa Margharita, Italy on the Mediterranean coast. Knapik, A.J. (1988). F. Elisabeth Crowell. In: American nursing: A biographical dictionary. V.L. Bullough, O.M., Church, & A.P. Stein, (Eds.). New York: Garland. (1931). Specialists in Internationalism. American Journal of Nursing. 31(12)1411-1412. Vickers, E.D. (1999). Frances Elizabeth Crowell and the Politics of Nursing in Czechoslovakia After the First World War. In: Nursing History Reveiw 7: 67-96. Vickers, E.D. (1983). F. Elisabeth Crowell: Pensacola's pioneer nurse. Journal of the Florida Medical Association. 70: 642-646.